Insulinomas are likely the most common tumor seen in pet ferrets. These are tumors of insulin-producing cells in the pancreas, and insulinomas are also called pancreatic islet cell tumors. The tumors produce an excess of insulin, which results in hypoglycemia (low blood sugar). Unfortunately, the tumors are most often malignant, although they can usually be managed with surgery or medication for a significant length of time. Insulinomas typically occur in ferrets around 4-6 years of age, although they can be found in ferrets both younger and older than this range. The onset can be gradual, with signs starting mildly, then getting worse and more frequent, or it can be quite severe and sudden. Occasionally, there are no obvious signs, and insulinoma is only discovered during lab testing done for other problems. Insulinoma can be found concurrently with adrenal disease, lymphomas, cardiomyopathy, and other diseases. The signs often occur in episodes, with periods of normal activity and behavior between episodes. If your ferret shows any of these symptoms, a trip to a ferret friendly veterinarian is a necessity. Diagnosis of insulinoma is most often based on clinical signs and low blood sugar (hypoglycemia) measured in a blood sample. Occasionally, blood testing may need to be repeated or done after a short (4 hour) fast to document low blood sugar, and some veterinarians also test insulin levels. Other tests are recommended to assess overall health and the possible presence of other diseases. 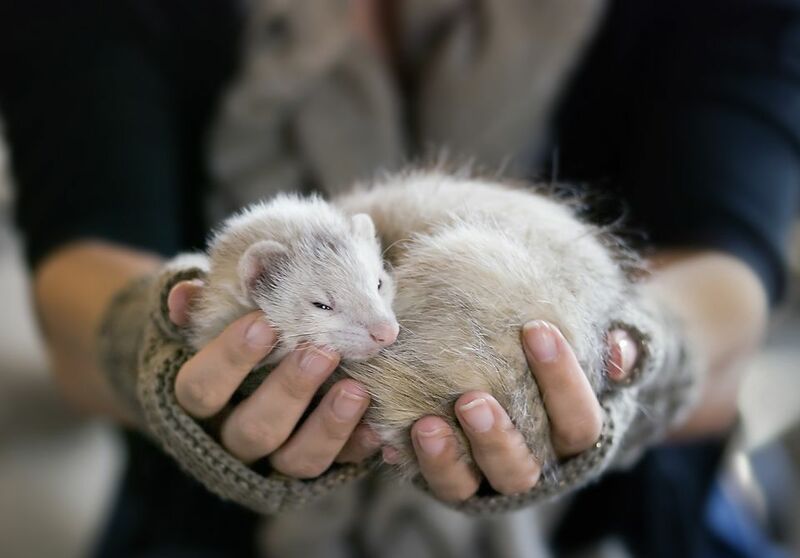 In an otherwise healthy ferret, the treatment of choice is surgery, which allows the removal of visible tumors (there are often multiple tumors). During surgery, your veterinarian should also check the adrenal glands for enlargement, as an adrenal disease may be present at the same time. Unfortunately, because of the nature of islet cell tumors, they often spread despite surgery making medical management necessary in the future. However, the surgery to remove larger tumors often alleviates the symptoms for some time or at least makes medical management easier. Blood sugar should be tested at regular intervals (2 weeks after surgery then every couple of months), so medical management can begin if it becomes necessary. Medical management may be needed after surgery or may be the treatment of choice for ferrets that are quite old or ill and therefore a poor surgical risk. The drugs prednisone and diazoxide can be used (alone or in combination), and while they help control the symptoms, they do not affect the progression of the disease. Dietary management is also important—make sure food is always available and provide a high-quality meat-based ferret diet (high in protein and low in carbohydrates). As well, sweet treats must be completely avoided as they can provoke a hypoglycemic episode (by stimulating the tumor cells to produce excessive amounts of insulin). Tips on emergency management of a hypoglycemic episode at home will also be provided by your veterinarian. Remember that medical management is meant only to help control the hypoglycemia and that as the disease progresses, the symptoms may worsen, increasing the dosage of medication required to control the symptoms (eventually, the medication may become ineffective). Ferret Insulinoma FAQ—Information from several ferret veterinarians (including Dr. Bruce Williams) on insulinoma signs, diagnosis, and treatment. Insulinoma - How to Recognize It and Emergency Treatment—a nice article that is not too clinical and provides lots of practical advice on dealing with a ferret who has an insulinoma. By Beth Camarow in consultation with Dr. Charles Weiss.